In order to achieve custom rendering for various chart related objects, a Brush is used to "paint" an area or another chart object. There are a number of different brushes which are available through the .NET Framework, where the most common type of brush is a SolidColorBrush which is used to paint an area with a single solid color. Notes: The following document is written in sequential fashion, starting with the most simple concepts, to the more advance topics. The majority of the brushes discussed in this document will be referred to as "WPF" brushes which exist in the System.Windows.Media namespace, however there are also "SharpDX" brushes which exist in the 3rd party SharpDX.Direct2D1 nampspace used for advanced chart rendering. Advanced brush types should ONLY be used by experienced programmers familiar with .NET graphics functionality. 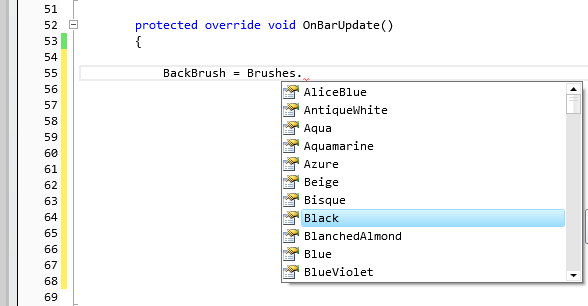 For convenience, the .NET Framework supplies a collection of static predefined Brushes, such as Red or Green. The advantage to using these brushes is that they are readily available, properly named to quickly find a simple color value, and can be reused on-the-fly without having to recreate an instance of the brush at run time, and do not need to be otherwise managed. There are 256 predefined named brushes which are available in the Brushes class. You can browse this list in the NinjaScript editor just by typing Brushes. 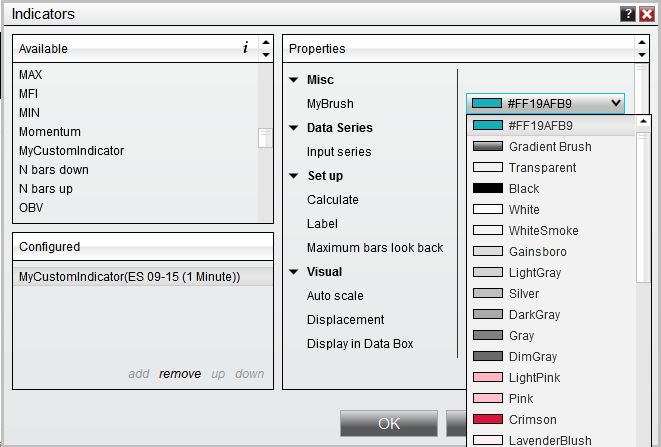 and using Intelliprompt to find the desired named brush of your choice. Note: Since predefined brushes are static, properties of the brush object (such as Color, Opacity, etc.) CANNOT be modified. However, this also means predefined brushes are thread-safe and do NOT need to be frozen. For customizing and freezing a brush, please see the section below on Creating a Custom Solid Color Brush. //draw a line using a predefined "LimeGreen" brush. In cases where you would like more specific color than one of the predefined brushes, you can optionally create your own Brush object to be used for custom rendering. In order to achieve this, you will need to initiate your own custom brush object, where you can then specify your color using RGB (red, green, blue) values Color.FromRgb(). •Anytime you create a custom brush that will be used by NinjaTrader rendering it must be frozen using the .Freeze() method due to the multi-threaded nature of NinjaTrader. •You may have up to 65535 unique Brush instances, therefore, using static predefined brushes (as in the section above) should be favored. Alternatively, in order to use fewer brushes, please try to cache your custom brushes until a new brush would actually need to be created. Warning: If you do not call .Freeze() on a custom defined brush WILL eventually result in threading errors should you try to modify or access that brush after it is defined. You can create a transparent brush using the Color.FromArgb() where the A parameter defines alpha transparency. Note: Anytime you create a custom brush that will be used by NinjaTrader rendering it must be frozen using the .Freeze() method due to the multi-threaded nature of NinjaTrader. If you would like a brush to become a public UI property, meaning the brush can be set up and defined by a user during configuration, it is important to be able to save the user's brush selection in order to restore that brush either from a workspace or from a template file at a later time. Saving a custom defined user input is done through a concept of Serialization which writes the object and its value to a .xml file. This process normally works fine for a simple user defined value type (such as a double or an int) but for more complex types such as Brushes, the object itself cannot be serialized directly to the .xml file and will result in errors upon saving the indicator or strategy to a workspace or template file. The example below will demonstrate and explain how to properly store a user define brush input which will be correctly serialized. In order to achieve the desired behavior of saving the user defined brush input, we will add the XmlIgnore property attribute to the public brush resource, which essentially tells the serialization routine to ignore this property. In its place, we create a new public string called "MyBrushSerialize" which will convert the public "MyBrush" to a string type which can then be processed by the serialization routines. We also add the Browsable(false) attribute to this public string to prevent this property from showing up on the UI, which is of no value to the end user. Tip: For a complete example of User Definable Color Inputs, please see the reference sample here. While the majority of the NinjaTrader platform's UI is WPF, under the hood, chart's use a DirectX API for faster performance. To render custom objects to a chart during OnRender(), a particular SharpDX Brush object must be implemented which reside in the SharpDX.Direct2D1 namespace. These brushes can then be passed as arguments to the SharpDX RenderTarget methods such FillRectangle(), DrawLine(), etc. While SharpDX Brushes behave much the same as previously discussed WPF Brushes, there are a few special considerations you must take as detailed in the following sections. Note: The SharpDX Brushes used in RenderTarget methods should NOT be confused with the WPF Brushes used with DrawingTool Draw methods. A SharpDX Brush must be created either in OnRender() or RenderTargetChanged(). If you have custom brushes which may be changed on various conditions such as in OnBarUpdate() or by a user during OnStateChange(), or you are pre-computing a custom brush for performance optimization, you will need to ensure the actual SharpDX instance is updated in OnRender() or RenderTargetChange(). Please see OnRenderTargetChanged() for examples of a brush that needs to be recalculated, or OnRender() for an example of recreating a static brush. For convenience, you can convert a computed WPF Brush to a SharpDX Brush using the ToDxBrush() extension method. Warning: Converting ToDxBrush() can result in performance issues depending on the number of brushes being used. If you experience performance issues with your custom SharpDX rendering, you should favor using SharpDX brushes directly instead of converting the brush using ToDxBrush(). Since SharpDX Brushes reference unmanaged resources, these brushes should always be disposed of after they have been used. Warning: Failing to dispose of a SharpDX Brush and other unmanaged resources can cause the platform to utilize more memory than necessary. In addition to the SolidColorBrush object demonstrated on this page, the .NET Framework provides more complex brushes which have more attributes than just filling an area with a solid color. Information on these special types of brushes can be found on the MSDN website: LinearGradientBrush, RadialGradientBrush, ImageBrush.